Hi guys! Here is a brand new video that is celebrating an old favorite! Basically this is just the best ever cocktail and it is an amazing mix of dessert and drink and it is TOO festive and gorgeous for it’s own good! It’s so much fun and EASY- have fun serving up a big platter of these for all of your friends! Also- this is so easy to turn into a mocktail, I just substitute the bubbly for sparkling apple cider and then the kids can partake too! Freeze your glasses until frosty. Add 2 tablespoons of pomegranate juice to the bottom of each glass. 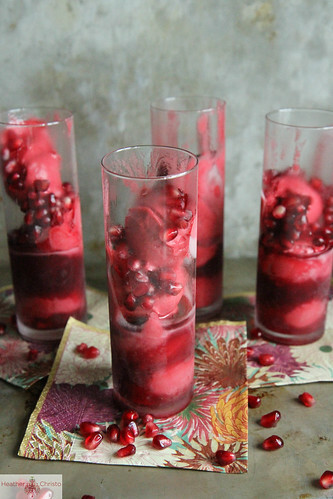 Then add a few small scoops of the raspberry sorbet and 1 tablespoon of pomegranate seeds to each glass. Best served with a straw like an ice cream float! Add 2 tablespoons of pomegranate juice to the bottom of each glass. 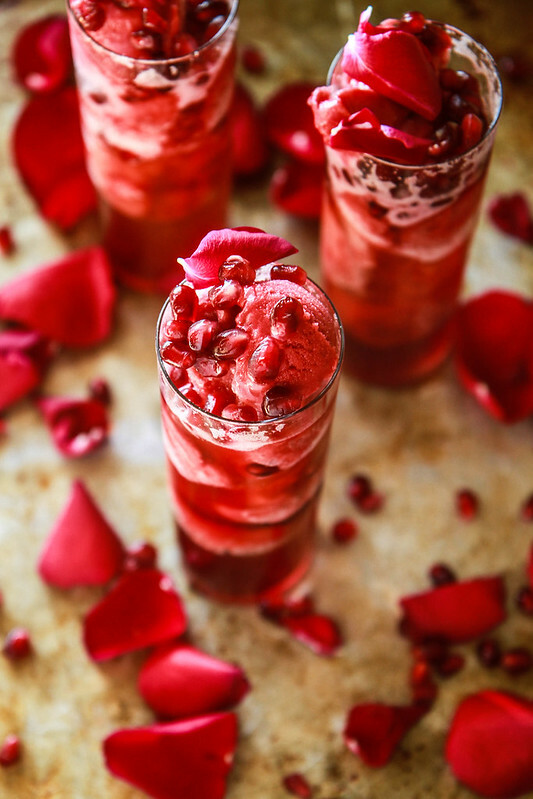 Add a few small scoops of the raspberry sorbet and 1 tablespoon of pomegranate seeds to each glass. How gorgeous are these! I bet they would be scrumptious made with pear or apple sparkling cider for a non alcoholic version for the kids. They are Vicki, and we did try them with Trader Joes sparkling “chardonnay” Juice (Non-alcoholic) and they were a huge hit! Great idea for summer kids party. With an 11-month-old in the house, we are facing a pretty lame NYE. But that’s fine. 🙂 These drinks are beyond pretty! Love them. And Palm Springs sounds so fabulous. As a native Seattlite I’ve long treasured the therapeutic properties of a vacation somewhere sunny in the midst of our dreary winter. Makes such a big difference! Enjoy. Oh Kare- with a 3 and 5 year old, ours will still be lame! A few more years till we are back to “normal” I suspect! Thank you! I know that some people might think of those kind of mini-breaks as very extravagent, but natives here know that they are practically essential to making it through the long gray patches unscathed! However- I think we have a few days of sun starting tomorrow! Happy New Years! These drinks look beautiful! Can’t wait to try it! Yum!! Perfect for a NYE celebration. Thanks Lauren! They would be a nice treat for NYE! So pretty, I love this!! a grown up float…I am kind of loving this cocktail. must make, asap! 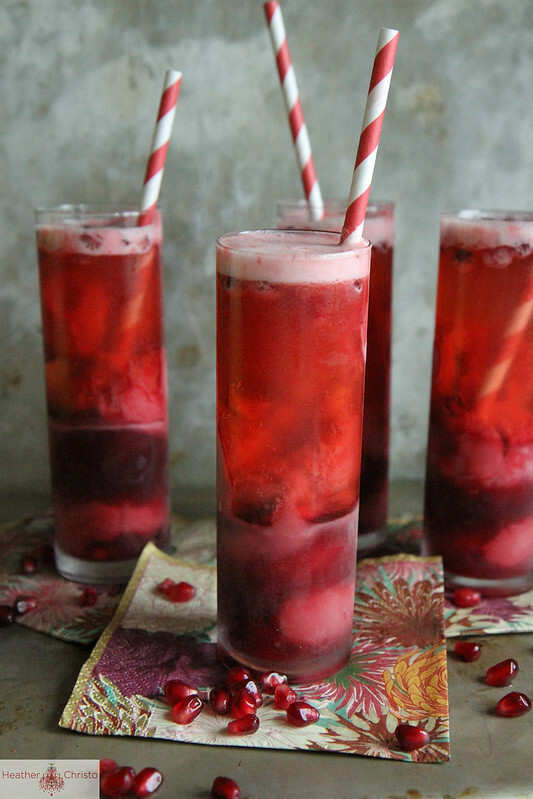 This cocktail is so festive and beautiful! Have a wonderful weekend! This looks gorgeous and sounds delicious. I love to make champagne cocktails. Delish!!!!! Where did you get the glasses??? Love them!!!!! Thanks Pat! They are just from CB2! 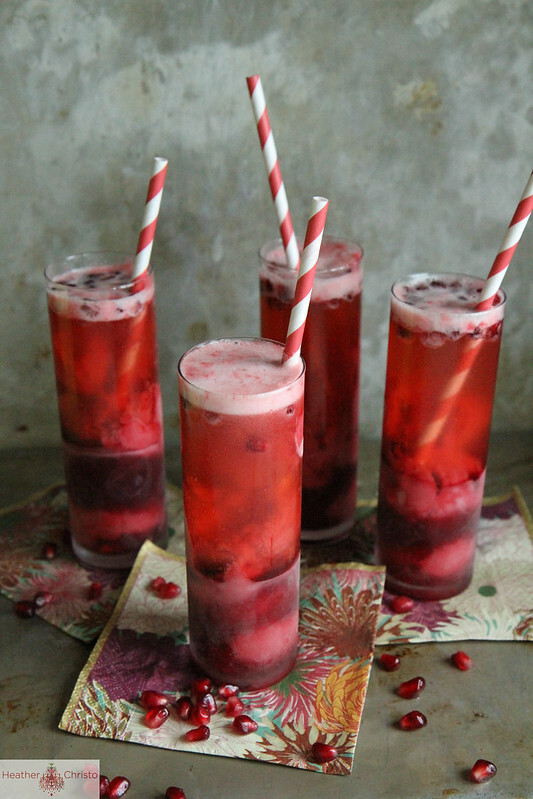 Pingback: Christmas cocktails Raspberry Pomegranate & Champagne! Heather, these are stunning and oh-so-fun! Our family tradition is to sip a cocktail or champagne before our fancy family dinner on Christmas Eve and these will be our drink this year. I love how festive they look and how easily they can be switched to a non-alcoholic version for the kids (or those who choose not to have alcohol). The stripey straws are a must! I have been on the hunt for a new holiday cocktail and I think I hit the jackpot! Thanks for having such a great honey hole of recieps! Thank you Tina- glad you are enjoying! This would look great on my holiday table. Pingback: A Boho Life – a UK Lifestyle Blog. Real life for real people. Raspberry pomegranate champagne cocktail definitely looks yummi! I love your recipe cuz it contains healthy ingredients! I’m also gonna share this post on my Flickr board my followers will love it. Gorgeous pictures. 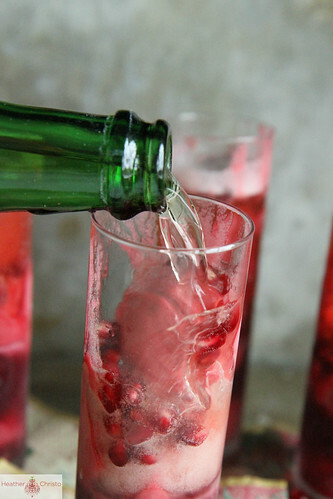 I made this raspberry pomegranate champagne cocktail for the super bowl party and it was a crowd favorite. I’m also gonna pin this post on my Pinterest board my followers will love it. Thanks for sharing, Kudos! Looks delicious– yum!! I will be making a virgin version of these for the little ones. This is a delight to the eyes. Can’t wait to try it.